I’m not sorry to say goodbye to February – it’s been a tough, snow filled month here in New England. I just hope that March brings us some sunshine to melt all that white stuff and cheer us all up! 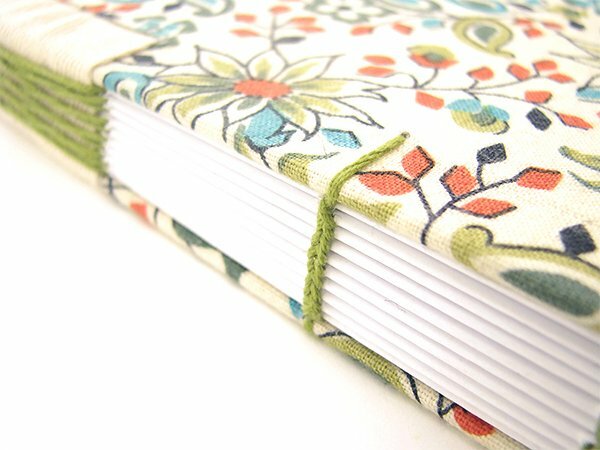 Today, I’m sharing the last ‘sewn over tapes’ binding (for a while). 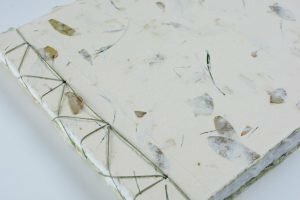 If you’ve been following along with my 50 Book Project, you’ll notice a theme – January’s books focused on long stitch bindings and February’s books were all ‘sewn over tapes’ bindings. March’s books will feature coptic bindings. If you want a quick recap, I’ve created a page where you can see them all listed and there’s also a button in the sidebar. 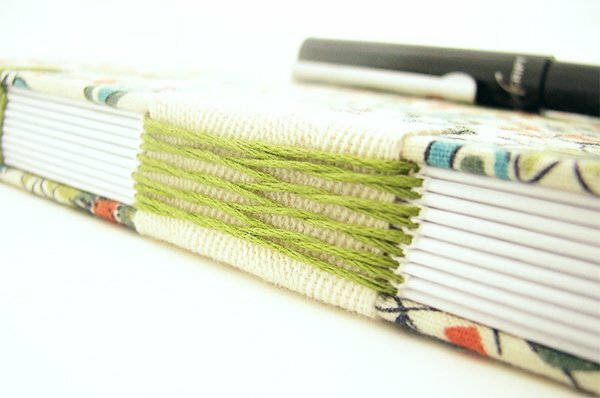 For book number 9, I combined a coptic binding with a french link stitch over tape. 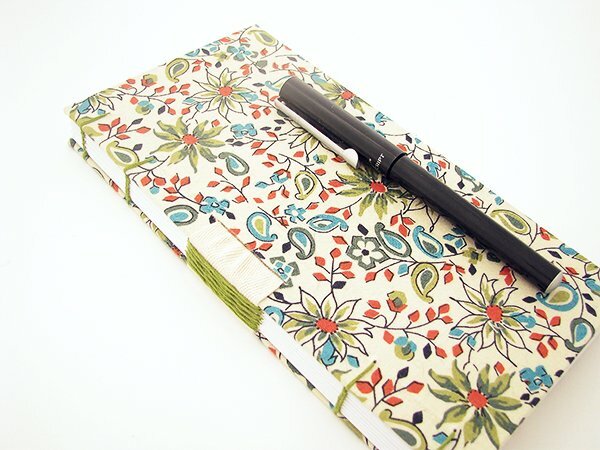 And I’m still smitten with fabric covers, so this one features a pretty quilting fabric that reminds me of Spring. 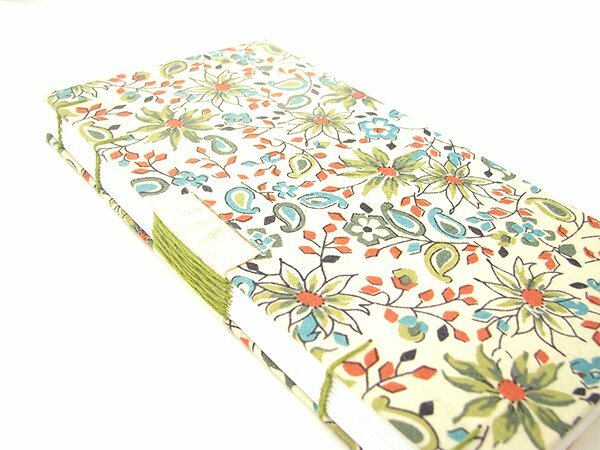 It’s a long, narrow book that measures 4″ x 8″. 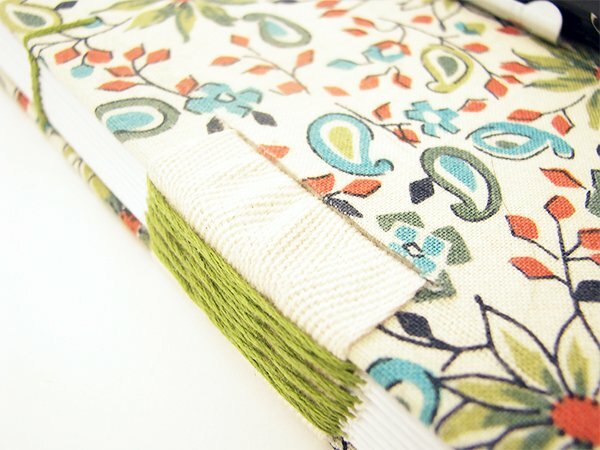 Here’s a close up look at the French link stitch sewn over a piece of wide twill tape. And here you can see one the 4 rows of coptic stitching. 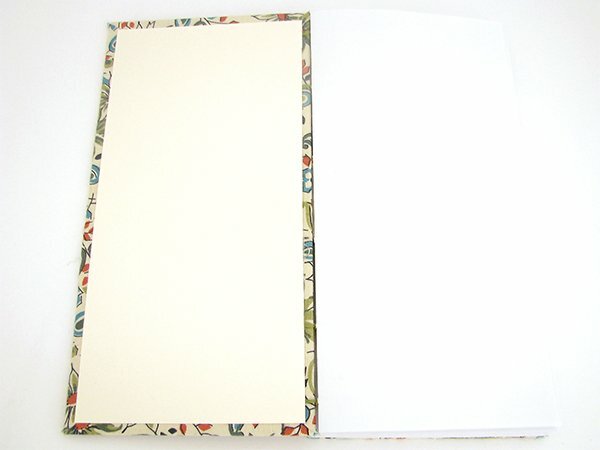 Iron-on fusible webbing was used to attach the fabric and card stock end papers to the book board. For updates on the 50 Book Project, please sign up for my weekly newsletter. Materials: Fabric, card stock,twill tape, embroidery floss, adhesive fusible webbing and copier paper. I am glad to be reminded about using fusible webbing for attaching fabric (so unpredictable with PVA) to book board. The book cover using your daughter’s PJ’s was a feat of magic because it seemed to be softer and oft washed fabric. Did you prewash this fabric or leave the sizing in it to help with handling? I am going to attempt to Gelli Print duck cloth to make some covers.